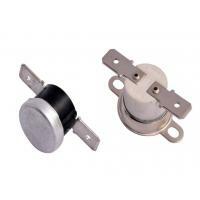 KSD301 thermostat temperature switch ,KSD201 thermostat switch , KSD thermostat switch,High Quality,Competitive Price! Key materials imported from America,key machines imported from Austria and Japan. Used in dishwasher,coffee pot,coffee maker,oven,water heater,rice cooker,water dispenser,water boiler,electric kettle,refrigerator and etc. 6.Normal Electric Strength: Not Broken within 2000V / 1 minute, No flash.